November 5, 2018 – Dry and mild weather continues with periods of breezy north wind. Weakening cold front sagging into far northern California early this morning. Skies are clear other than some high clouds moving across the area in northwest flow aloft. North winds have picked up a bit across the northern Sacramento Valley (10-15 mph) in response to tightening surface gradient behind the front. Current temperatures are a mixed bag compared to 24 hours ago (generally within +/- 5 degrees) and range from around 30 in the colder mountain valleys to the mid 60s across milder portions of the Sacramento Valley. Temperatures will be a bit cooler today as the front washes out across NorCal. Northerly breezes will spread across the Central Valley with gusts around 15-25 mph. 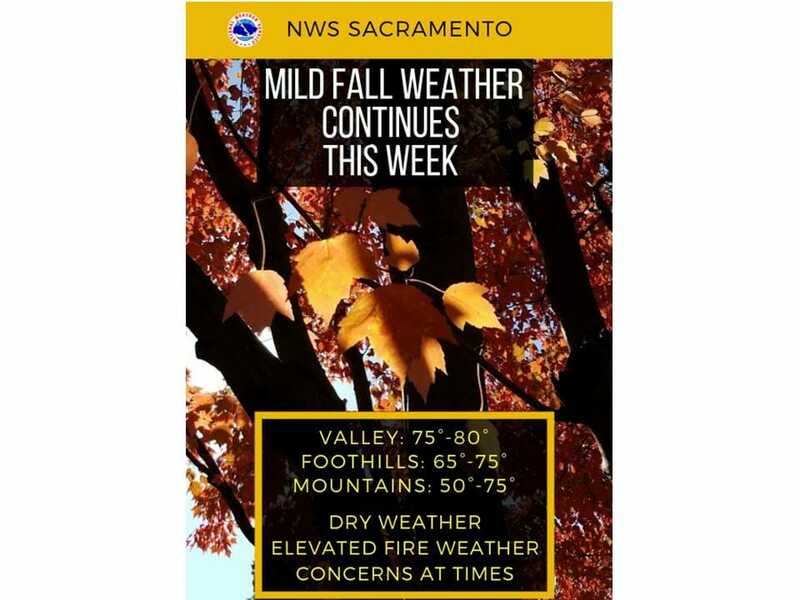 Breezes expected to peak tonight and Tuesday as MFR-SAC gradient forecast to top out around 11 mbs (similar to past several events) and barrier jet sets up along the west side of the Sacramento Valley where a few ridgetop locales may see gusts around 30-35 mph. Lighter northerly breezes expected Tuesday night into Wednesday, then stronger northeast wind forecast to return Wednesday night and Thursday as the tail end of another cold front moving into the Great Basin brushes the region tightening surface gradients once again. High temperatures will remain around 10-15 degrees above average through the week. Models show an upper ridge persisting through the forecast period, with the ridge axis moving over the Western States late this weekend into early next week. 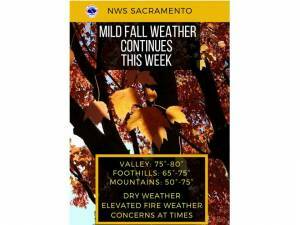 As as result, dry conditions and above normal temperatures will continue across interior NorCal. Look for Valley highs in the 70s, and mid 50s to mid 70s over the mountains. Previous articleCaltrans Sierra Roadwork Schedule through Saturday, Nov. 10, 2018.